The Carretera Austral and the Queen. 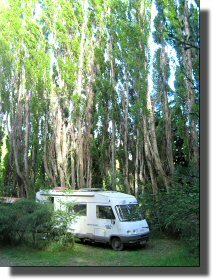 We (Mel and Mog) are parked two kilometres outside Coyhaique, Chile in the delightful Camping Alborada (S45.551985 W72.066495) waiting for two new tyres for Mog to be delivered from Santiago. The camp site is large but only has room for about four tall (over 2 metres) overland vehicles near the entrance. The tall swaying trees provide shelter from strong winds. Each pitch has water, a sink, electricity (220 volts), shelter and a barbecue pit. Costs are about $9.00USA per vehicle per night. Sondra, her family, and dog Alaska will make you feel right at home. A taxi into town is about $3.00USA. Recommended. We expect to be here another three or four days. A few days ago we crossed into Chile (again) at Chile Chico and parked at Chile Chico Camping (S46.538057 W71.725362). Whilst we were there we met two German couples traveling in a rented Unimog campervan and two BMW motorcycles. The men rode the motorcycles and the two women drove the Unimog. They had intended to sleep in the Unimog but had ended up staying in hostels because the interior of the Unimog was unsatisfactory. It certainly looked unfinished and very basic. See www.travelmog.de for costs etc. The Paso Las Llaves from Chile Chico to El Maiten on the Carretera Austral (the main North-South road in this part of Chile), is said to be dangerous. Lonely Planet says it is "a scary and stunning road trip of abrupt curves, blind corners, loose gravel, steep inclines high above the lake and no guard rails". They exaggerate. In 2007 the scenery it is still stunning but the road is (alas) not very scary. We spent the night of 2007-01-29 at Puerto Guadal . We were told there was a camp site there, and there was, but it had been closed for many years. We camped just outside of it anyway. (S46.846968 W72.698947). Late in the evening we were approached by a man, who we thought was going to tell us to move. However, it turned out he was offering us electricity and water! We thanked him, but declined. At this point the man's two daughters spotted Judy who, for reasons too complicated to explain, was wearing a tiara to celebrate her "39th" birthday. The girls asked her if she was the Queen of England. 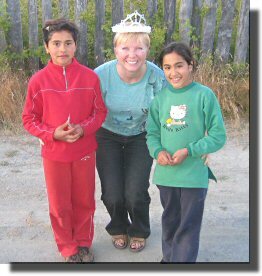 Judy admitted she was not, and gave them the tiara. Shortly after, the girls (Barbara and Victoria) showed up with a small rawhide gift wrapped in festive paper for the birthday girl. 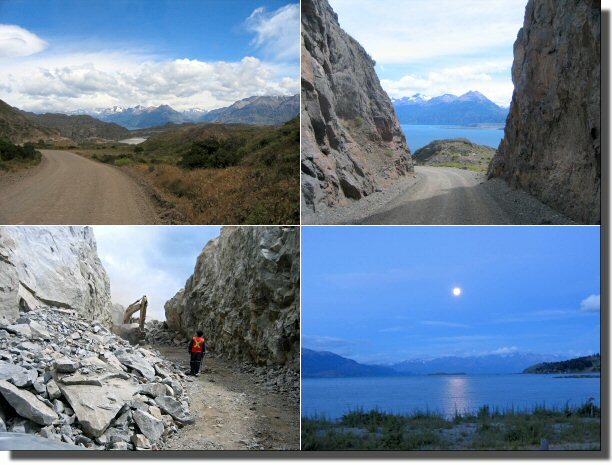 The scenery on the Paso Las Llaves and the southern part of the Carretera Austral was impressive, though there were a few rough bits. Short version: Mick fixed it. Long version: Mick reasoned that because the loss of power was accompanied by some black smoke, but no nasty noises, the cause was likely to be a restriction in air supply to the engine. A quick look at the engine revealed that the rubber hose between the intercooler and the inlet manifold was collapsing when the engine was revved. The air filter was examined and found to be OK, the turbo was examined and found to be free running. The waste-gate was then examined and found to be disconnected from the turbo over-pressure sensor (if the turbo output pressure is too high the pressure sensor opens the waste-gate to allow the hot exhaust gasses to by-pass the turbo, effectively switching it off). The cause of the failure was found to be a missing "E" clip. Value $0.01. When replaced Mel was back to full power. The following day, just outside Coyhaque , Mog had a puncture. Because Mog's spare tyre was already in bad condition (usable, but cut down to the wire and well worn), Stephen decided that two new tyres were required. Mog's tyres are not a popular size in Chile (335/80 R 20). Indeed Comercial Ruedamas Ltda were only able to find three in the whole of Chile. Two of these were ordered from Santiago on Wednesday morning and delivered on Saturday morning. On Saturday afternoon we set off north.